This creature comes from certain versions of the story of Narasimha, the man-lion avataram (incarnation) of Vishnu. As most people know the story, Narasimha kills the demon Hiranyakashipu and rescues his devotee Prahlada, and that's the end of it. But a lot of Puranas continue the story as follows: after Narasimha kills Hiranyakashipu, he is still in a state of rage (because his devotee was threatened), and he is destroying everything in his path, starting with the former Asura armies of Hiranyakashipu. The gods are worried that Narasimha will destroy the entire universe in his wrath, so Shiva takes the form of Sharabha, a half-lion, half-bird creature, in order to subdue and pacify the angry Narasimha. 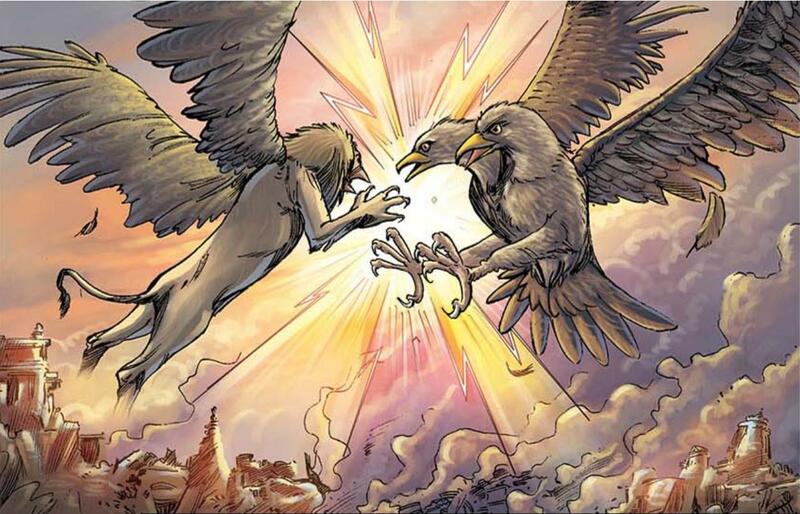 That's where most versions end, but some versions of the story go even further: in response to Sharabha, Narasimha creates Ghandaberunda, a two-headed bird creature of his own which overpowers Sharabha, and then everyone calls it a day. My question is, in what Hindu scriptures is this story of Ghandaberunda mentioned? This article, which is Wikipedia's source, says that Ghandaberunda "is mentioned in some Puranas and in certain regional scriptures in South India". Does anyone know what Puranas are being referred to, and what these South Indian "regional scriptures" are? The only thing the article says is "HH Chinna Jeeyar has observed that Ganda Bherunada Nrsimha Avatharam is mentioned in a minor text known as Nru Kanteerava abhyudhayam?" What is the "Nru Kanteerava abhyudhayam"? Googling for it doesn't turn up anything useful. There's plenty of artistic and sculptural depictions of Ghandaberunda, like the coat of arms of Karnataka, but can anyone shed any light on what textual sources discuss him? There is no description of Ghandaberunda in any authentic Purana or Agama Vedic texts, but Sharabheshwara is found in plethora of scriptures including Skanda Purana, Bramahanda Purana, Shiva Purana, Linga Purana etc. See Sharaba Upanishad in Gyana Khanda of Atharva Veda, which declares Him as Vedic God and most fierce incarnation of Veerbhadra. Tantra and Agama texts describe him and give detailed procedures for Sadhana, worship, rituals, Tantra, Mantra and Yantra. He is also known as Akasa Bhairava in Agamas and Tantra. This Ghandabherunda is recent interpolation of a bird that never existed. It was sheer attempt of few sectarians and even that story ends with Ghandabherunda being withered apart by Sharbha by power of Pratyangira Devi. Amar Chitra Katha shows it. So, Ghandabherunda is just recent interpolation done by few sectarians and has never mentioned even implicitly in any Purana or Vedic or Agamic Sastra at all. The jealous guy who says here that those few books (fictional novels) of south are made just recently and there is no comparison of them to Puranas or Upanishads while whole world and Hindu population relies on them. In matters of dispute, Vedas are authentic scriptures to the validate the claims and they only favor Sharabhweshwara as authentic. Other books of few sectarians fictions such as 'Charvaka' Jain scriptures do not hold any value and most people know and revere Sharabha as He is truth. You few people in false world believe them but reality is Sharbheswara prevailed after killing Narasimha and He said, "Vishnu and I are one and same and those who want my benevolence should chant mantra of Narasimha too". So real spiritual people know very well these all are Leelas and Vedas say God is one and declares "Eko hi Rudro na dweeteyay" - only Rudra is God not any other Devaa and from Him comes trinity and Universe. So, He is Narasimha and Vishnu too and all are one Parabramhan Shiva. Even Vaishnava Puranas of Krishna say that He loves Radha as his own heart but Shiva is his Atman and He worships Shiva only and always so much that he will begin to follow the person who chant name of Mahadeva three times to enjoy bliss of Shiva's name. Krishna and all 24 Avatars of Vishnu have worshiped Shiva. Vishnu's Sudarsana Chakra is given by Shiva and Vishnu is first shaiva and one of his name is "Saivashiromani" which means the foremost of Shaivas. He happens to be the first one to worship Shiva. He says his all powers are because of Shiva. Sri Vishnu also says He doesn't like people who don't worship Shiva even though they worship Him. Shiva also says my Bhaktas shall chant Vishnu Mantra. So good Bhakta won't refute Sastras and would see God as one in different forms. The one beyond time is Mahakal Shiva Linga and it depicts Nirakara Paramatman. Vishnu and Shiva are names of one same God Maheswara. The Mysore royal family have been worshipers of Sri Vidya and were initiated into the secret Sri Vidya cult centuries ago and Gandabherunda Nrsimha aradhana is considered a part of some Sri Vidya schools. The Gandabherunda symbol (The double bird) in the coat of arms was borrowed/extended by the State of Karnataka from the Mysore royal family tradition when the State was formed in November 01, 1950. Sarabha reference only in Shiva Puranas which considered to be Thamasic purana nature. There is no reference about Narsimha Sharabha fight in Mahabharatha and Ramayana which is considered to Ithasas primary resources. As far as I know when Lord Narasimha got out of control because his anger could not be controlled, Shree Devi Pratyangira manifested and became Lord Narasimha's mate. So due to the love of Shree Devi Pratyangira Lord Narasimha calmed down and the destruction came to an end. Not the answer you're looking for? Browse other questions tagged mythology vishnu avatars shiva narasimha .